My friend is about to have a baby so we wanted to bring her something special when we came to visit. M and Tomas went out to the store this morning and M picked out all the ingredients for a sorbet. This recipe makes two pints (our ice-cream maker handles one pint at a time so we had enough for two batches). We brought one pint (ran out of time to make that second batch), and had exactly enough for 7 adults and 3 children to each have a scoop. Boil mixture until it has the consistency of syrup. Set aside until cooled. Cut two nectarines into sections, then blanch (boil in plain water) for a few minutes. Drain, then purée. Follow the instructions for your ice-cream maker. 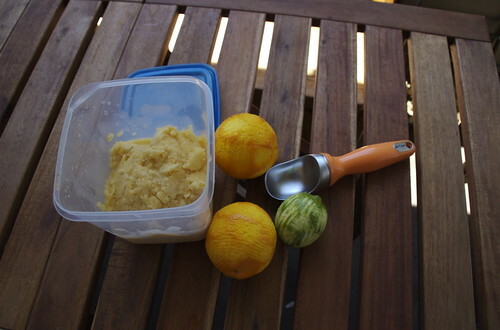 This sorbet took about 40 minutes in ours.